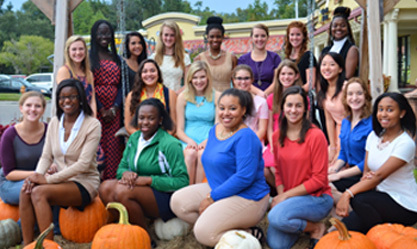 The Junior League of Tallahassee (JLT) Teen Board offers high school age junior and senior women from all local high schools a foundation of service and leadership. The JLT Teen Board provides the opportunity for community involvement and to enhance leadership, advocacy, and fundraising skills. Members will receive training from JLT members and community leaders and will have the benefit of interacting with other young women their age from across the community. 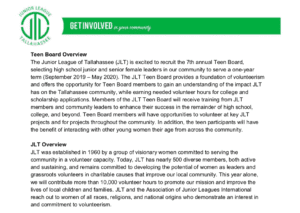 Teen Board members will gain a better understanding of the impact JLT has on the Tallahassee community while earning needed volunteer hours for college and scholarship applications. Volunteer opportunities include service with the current JLT community partners, the Big Bend Homeless Coalition HOPE Community and Second Harvest of the Big Bend, as well as within the League for events such as Operation Prom and Done In A Day events. 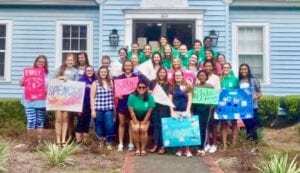 In addition to providing service to the community, the members of the Teen Board benefit from trainings on leadership, self-esteem, living an active lifestyle, professionalism, and more. Applications are now available and will be accepted through April 26, 2019. Click below for an information sheet on the application process.